Back in March, Adam and I made the decision of starting to adapt to a ketogenic diet. I have mentioned this a few times already, but ever since we have cut out an excess amount of carbohydrates, we have felt more energized when we wake up in the morning and I have found that my acne has cleared up quite a bit. Since we have fully embraced going keto, we have been taking more time to learn about net carbohydrates and how it plays a part in our metabolism. Through having a stricter diet that consists of high fat and low-carb (with moderate protein) intake, we have both found health improvements and we have even lost a little bit of weight along the way! Today, I am sharing a smoothie recipe that is ideal for those who are also on a ketogenic diet like we are. 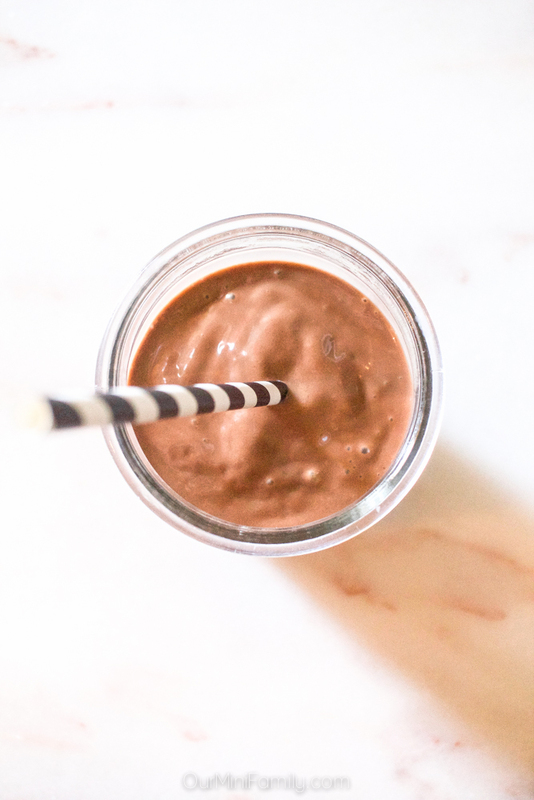 This avocado cocoa bomb smoothie is packed with good fats and is lower in carbs than traditional smoothies. 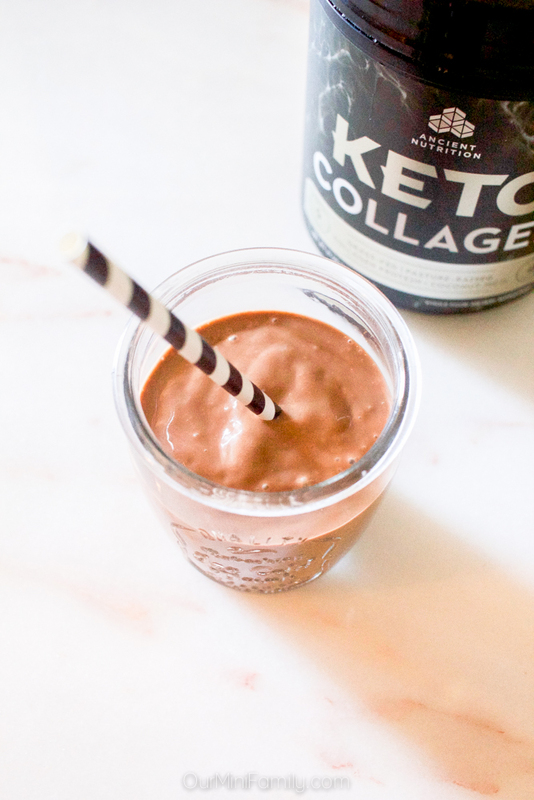 With a good amount of protein and a high amount of fat, this smoothie made with Ancient Nutrition Keto Collagen is a great way to start the day or serve as a meal replacement around lunchtime that tastes more like a dessert than a meal! 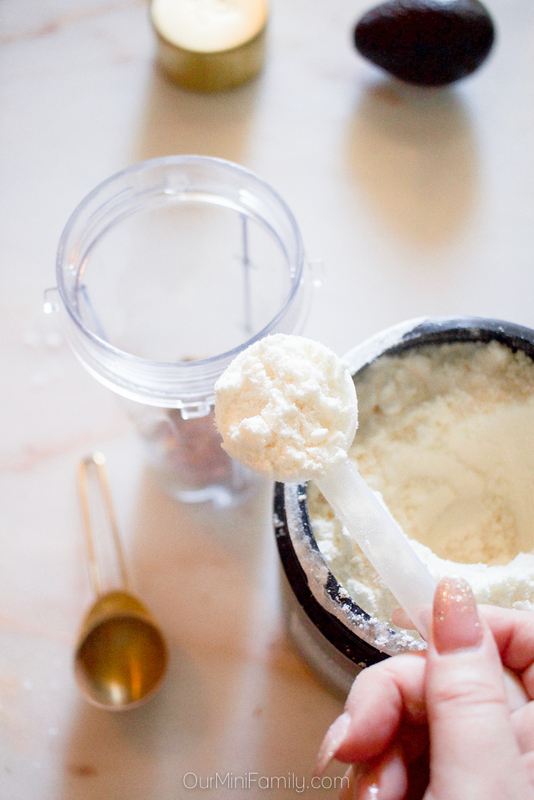 Since Adam and I first adapted to a high fat and low carbohydrate diet, we have found that so many of the powders that we used to use to make smoothies at home are too high in carbohydrates for our strict macro needs. Keeping our daily intake of carbohydrates below 30 grams a day has certainly been a transition for us, and it surprised us to see that so many of the old powders we used to use would have had us exceeding our carbs limit in just one serving. When I first learned about Ancient Nutrition Keto Collagen, the first thing I did was turn it around and read the nutritional facts label. It has become a habit now with the keto diet that I always look at the net carbs on the nutrition label before I even consider buying it. 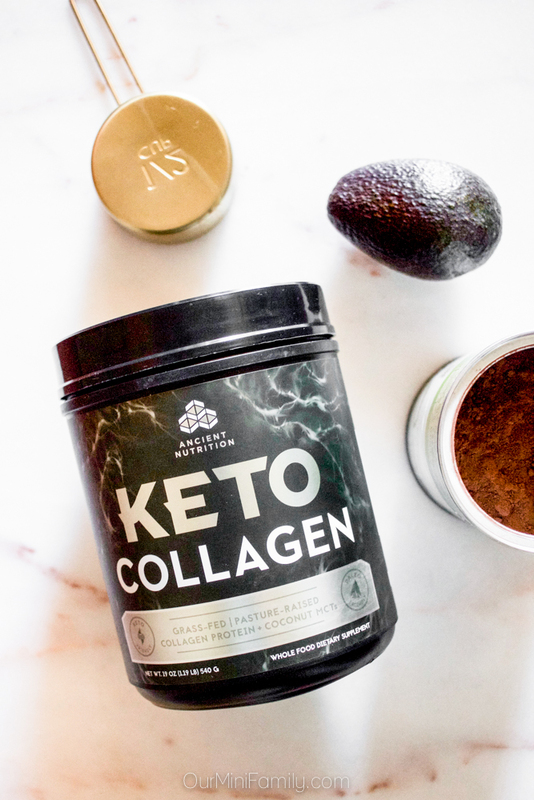 With 0g Carbs, 3g Fat, and 15g Collagen (collagen peptides with coconut MCTs to aid in the success of our diet), the Ancient Nutrition Keto Collagen powder is an ideal supplement for us to incorporate into our keto smoothies! It is also free of dairy, soy, and gluten, so it is an ideal choice for many different kinds of dietary needs. Feel free to take advantage of this 15% discount available to our readers for a limited time using code KETOCOLLAGEN15 through 9/30/18. If you are curious and want to learn more about a keto diet, we definitely recommend searching online for more information about it and talking to your physician to see if it is right for you. Adam has a handful of his gamer buddies who have had a lot of success switching to a keto diet, and they recommended that he do his own research into the health benefits of eating a ketogenic diet, what ketosis actually is, and also what kinds of foods are keto-approved. 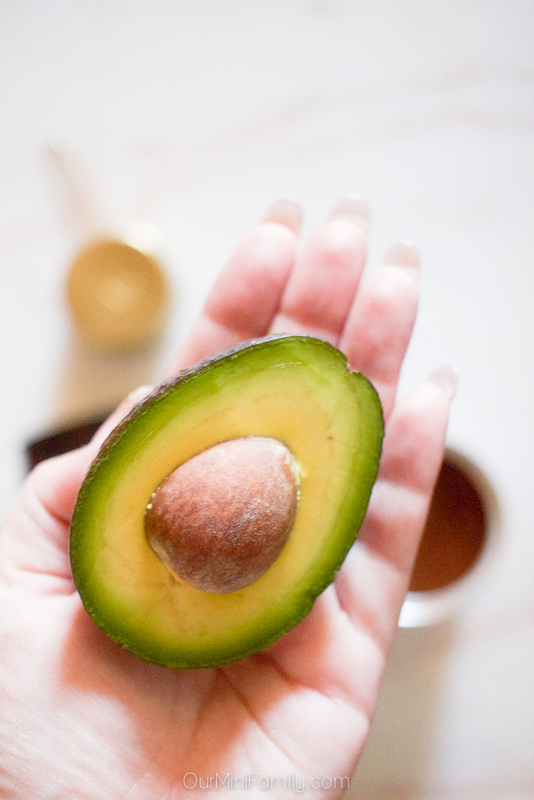 Avocado, the ideal keto diet ingredient, has become a staple in our home! It is high in fat and serves as a great base for many kinds of low-carb recipes we have been experimenting with over the last couple of months including this cocoa smoothie! 1 Chop the avocado in half, remove the pit and the skin, and fill the bottom of a blender with the avocado. 2 Add one scoop of Ancient Nutrition Keto Collagen into the blender, followed by the cocoa powder, almond milk, and finally the ice cubes. 3 Mix the ingredients on high in a blender (or a similar kind of smoothie mixer) until it is completely blended and smooth. 4 Serve immediately and enjoy! Don’t forget to save this keto-friendly recipe to Pinterest and Facebook! Learn more about Ancient Nutrition Keto Collagen here! Now that is the drink that I can do every day. That looks absolutely amazing! I am trying to eat better and this is one way I can do it in a delicious way. This looks like a delicious smoothie that is also much healthier for me. I love the addition of avocado. I usually switch to smoothies for breakfast during the summer months. I'll be adding this to my menu. Yum!! This looks delicious! We put avocado in all our smoothies so I am sure we would love this version! Saving for later! I will make this with my daughter! Looks great and super good for you! I need to learn more about the keto diet it seems like a great way to lose weight. This smoothie seems like a great and nutritious drink for any time of day. We don't do the keto eating lifestyle. This drink does sound delicious and of course we like our chocolate and avocado. you totally had me at avocado! as i have mentioned on your insta this looks so refreshing and i cant wait to check how it is made. i also love collagen so i will try this out. I don't follow that diet but I would gladly try this smoothie! It looks really good and refreshing, perfect for the summer. Plus, I'm a huge fan of avocados! This sounds like my kind of smoothie. I tend to love anything with cocoa in it, so I'll give this a try. I have a friend that likes avocado quite a bit, maybe she might like this. I do like smoothies but prefer fruity ones. This sounds amazing!! I have been following a Keto eating plan and this looks like I must try it! I'm a HUGE fan of avocado but I've never tried it in a smoothie. I definitely need to. This sounds like a great keto-friendly smoothie! I love anything with avocado!! I love avocado and this looks delicious. I have never tried any keto products before. Now this sounds like an interesting smoothie! Avocado really seems to be the ingredient of the moment as well. I love combining avocado and chocolate together! This smoothie looks fantastic and I will have to try it next week. This looks absolutely amazingly delicious! I never think of avocado in smoothies, I need to up my game! Wow, I love Avocado. I never get to try this cocoa avocado smoothie and I would love to try. Avocado ice cream actually is one of my favorites. I love avocado and although I don't follow a ketogenic diet, I won't mind making a smoothie this good and healthy. I have heard so much about keto diets and I think it's really good for people. I'm just used to following my whole 30.